I have a bass player friend who is interested in the OD2 w/Mosfet modded for bass guitar. Any thoughts? what did you do, and what were the results? oops, just browsed through the OD2 instruction, saw what I needed there. Works okay for me..I don't remember exactly what all I did different but I went by the guidelines in the instruction guide...so I'd start there. It doesn't sound great for heavy dirt on bass, but for light overdrive and the boost especially, it works. 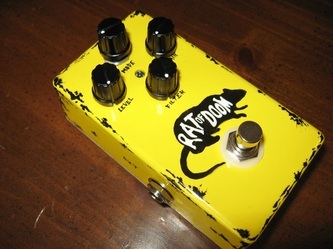 For heavier distortion it is pretty good as a pre-drive into something like a mouse or metal muff. I generally set mine for minimal dirt. I built the OD2 and followed the instuctions to make it more bass friendly and still found a lot of low end loss. I'd switch to bigger cap values than they suggest if I was to do it again.